Origin and Habitat: South America (Venezuela, Suriname, Peru, Brazil: Roraima, Amazonas to Rio Grande do Norte, Mato Grosso to Paraíba to Paraná; Bolivia, Paraguay, North Argentina) , cultivated in tropical America and elsewhere in the tropics. Habitat and ecology. This species grows naturally in riparian areas of the Caatinga of northeastern Brazil, where is a crucial resource for Spix's macaw (Cyanopsitta spixii), which is extinct in the wild with fewer than 100 birds remaining in captivity. Any future reintroduction would have to provide sufficient T. aurea for nesting and other purposes - while the tree is not considered threatened on a global scale, locally it has declined due to unsustainable use for timber. Wild animals eat flowers and fruits. 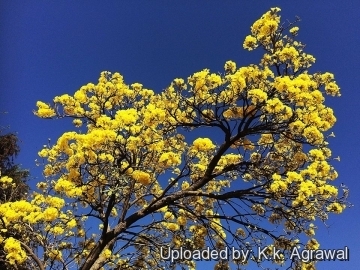 Description: The Tree of Gold (Tabebuia aurea) is a most striking tree when in flowering. 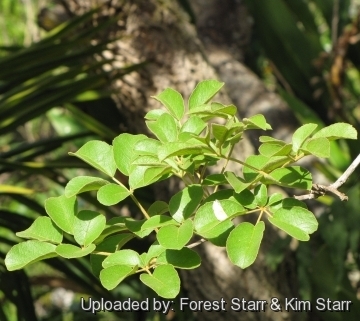 It is a small (5-10 m tall), dry season-deciduous tree with thick, narrow, lanceolate leaves. 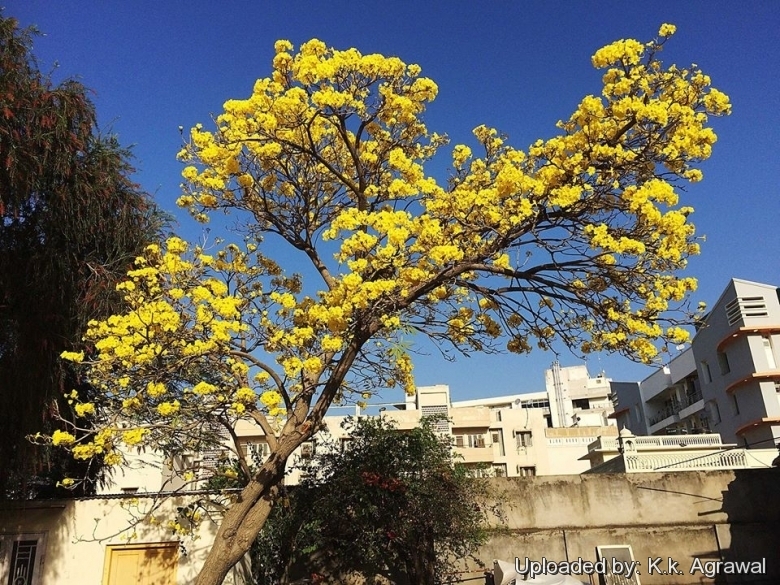 The plant bears dense, terminal clusters of bright yellow, funnel-shaped flowers in a leafless condition. The bloom cycle is relatively short, but the tree in full flowering looks most beautiful. 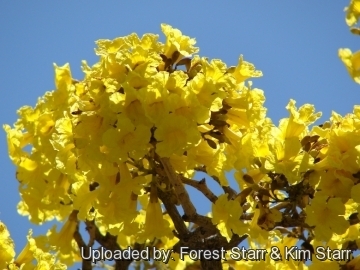 Remarks: This species is best known in literature and in cultivation as Silver Trumpet Tree (Tabebuia argentea). The name 'argentea', meaning 'silver', refers to the silver cast of young foliage and branches. 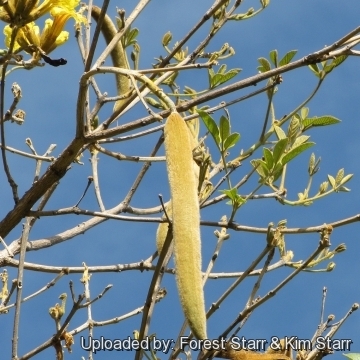 The silver cast helps distinguish this tree from the other yellow flowering species. 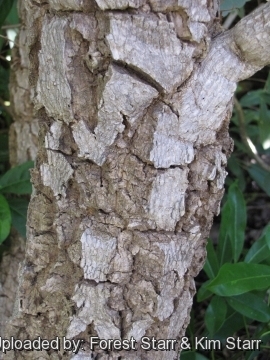 Stem: The tree is most easily identified by its puffy, fissured, cork-like bark. 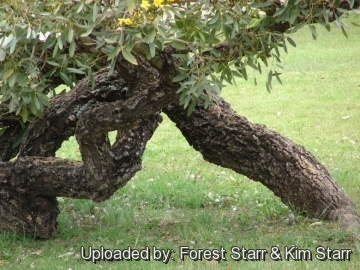 Its branches often grow with irregular curving patterns, giving the tree an interesting shape, and the trunk and canopy are frequently asymmetrical. Leaves: Palmately compound, 5-7-foliolate; leaflets oblong, 6-15(-18) cm long, up to 4 cm broad, rounded to broadly obtuse at apex, rounded to narrowed at base, entire, densely silvery-lepidote ( with silvery scales) both above and below, the lateral nerves 6-9 pairs, the terminal petiolule up to 4 cm long, the lateral ones shorter. Inflorescences: Loose terminal panicles or umbels, few-flowered. Flowers: Bright yellow, showy; calyx campanulate to funnelform, yellowish, about 2 cm long. Corolla campanulate, 6-7 cm long, flaring mouth 6-6.5 cm broad, the 5 lobes semiorbicular, 2 cm long. Blooming season In subtropical and tropical regions, this species displays it bright yellow blooms on leafless shoots at the end of the dry season. 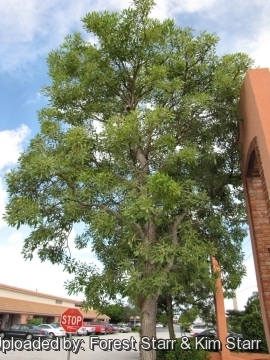 In Florida a few trees will begin flowering in late February, but the best performance comes in March or April. In summer, there is a second flower display on some trees. The second flowering does not match the intensity of the March bloom and there is no leaf loss. Fruit: The fruit is a slender 10(-15) cm long capsule, oblong, narrow at each extreme, glossy, grey or grey-brown with black lines, somewhat woody. 7) Bueno, M.L. ; Damasceno-Junior, G.A. ; Pott, A. "Structure of arboreal and herbaceous strata in a neotropical seasonally flooded monodominant savanna of Tabebuia aurea". Brazilian Journal of Biology 74 (2): 325–337. (May 2014). 11) Wikipedia contributors. "Tabebuia aurea." Wikipedia, The Free Encyclopedia. Wikipedia, The Free Encyclopedia, 21 Dec. 2015. Web. 2 Apr. 2016. Cultivation and Propagation: The Tree of Gold is one of the most spectacular of flowering trees, especially when grouped. Flowering is brief, intense and is usually started and completed by all trees in close unison. It is planted as an ornamental and persistent tree. It is good for planting along avenues and in parks and home gardens. Soil: This species grows well in a wide variety of soils and requires little maintenance. Hardiness: Tropic and subtropics only. The tree at young stage is likely to be damaged by frost. Uses: Park, Patio, Specimen, Street scape. 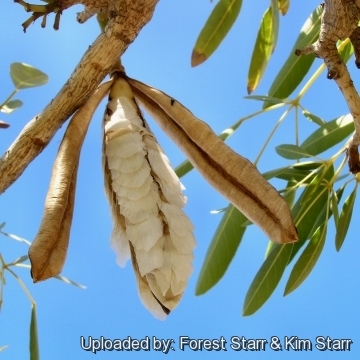 Traditional uses: This species is used against flu, hepatitis and inflammation. The leaves are are febrifuge and purgative. The roasted leaves are a mate substitute, stimulant.